Two of our favorite things in the world are Christmas and Jessica Cameron so seeing them both come together in All Through the House from director Todd Nunes is pretty damn sweet. This 80s-style slasher film features a deranged Santa slayer who rips through the town of Napa, California, for some yuletide terror. It’s currently available in all formats (Blu-ray, DVD, and streaming) on Amazon; and we were provided with some merry captioned images for you to enjoy below, the first of which is an exclusive. You’ll also find the film on iTunes and VUDU. Ashley Mary Nunes, Jennifer Wenger, Melynda Kiring, Lito Velasco, Natalie Montera, Danica Riner, Jason Ray Schumacher, Johanna Rae, and Cathy Garrett co-star with Cameron. A violent killer is hiding behind a grisly Santa mask, leaving a bloody trail of slaughtered women and castrated men to the steps of the Garrett house. Rachel finds herself in a horrifying nightmare as she discovers the twisted secret behind the mask. Santa brings a special bag of presents for Jessica Cameron (for folks who’ve seen the film, they’ll get the inside joke of this one). Johanna Rae is trying to make it onto Santa’s Naughty List. Did you make it on Natalie Montera’s Christmas card list? Group photo of the cast. 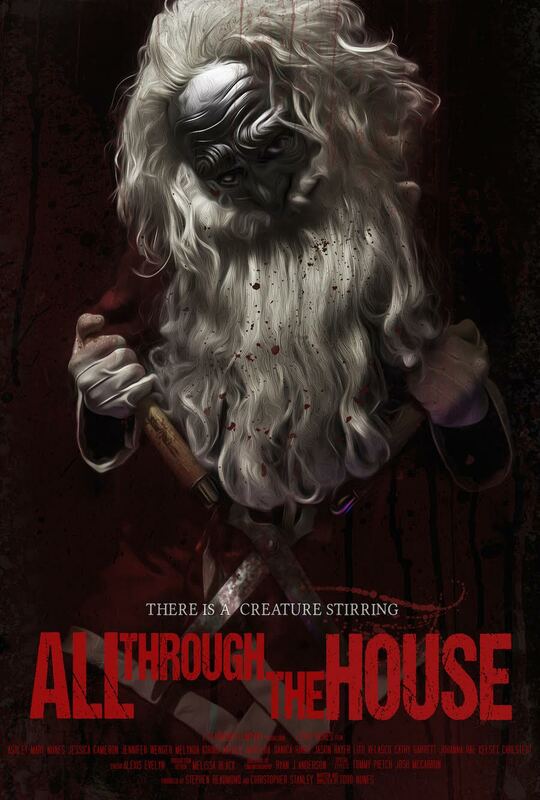 All Through The House Poster. Rights to The Vampire Chronicles Revert to Anne Rice; Movie OFF and TV Series ON!